Tonight I went down to the harbour equipped with pieces of card, oil pastels, inks and gouache. It was incredible but I dusted down my old doctor's bag, which was in the cellar, and filled it with art materials, just as I did in the 1960's. I paced self-consciously around the harbour for fifteen minutes but at 9-30 I started to draw. The rain started to come down steadily but I carried on, able to work as the oil pastels resisted the rain. I got very wet and just after an hour with a reasonable image, I returned home and completed it. I am reasonably pleased and very excited at working outside again. It will be the first of a series. I am having an exhibition from 6th - 9th November at the Imperial Hotel. I am very overdrawn at the bank and a series of harbour scenes at night will surely guarantee me some sales. My other work will stand up well next to the impressionism-expressionism of this harbour series. Rebirth? Saturday night saw me once again down at the harbour. I produced one large drawing from the slipway. The light I was working in was extremely poor and red at that! On finding it difficult to sustain the momentum I packed up after an hour and a quarter ready to get on a bus and go home. Instead I saw the brilliant red and pale blue of the reflections looking across diagonally from the corner of the harbour to Macari's Cafe. I produced a small very intense drawing which seems to have scored. I have been 'limping' along with the harbour pictures. 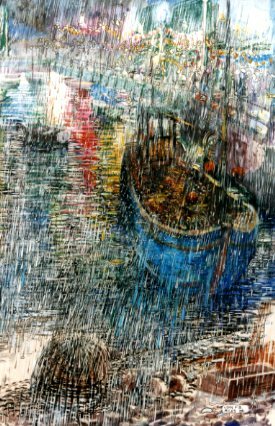 Working into one with a fishing boat and summer rain. I have started an oil of a harbour reflection sketch. Although it is mundane and seemingly pure impressionism-expressionism, it gives some hope to me. One day last September I got trapped by a heavy rainfall, halfway between the college and the 'South Street Glass Works'. The rain was torrential, and having no coat I pressed myself against the alcove of a wall. I watched the enormous raindrops crashing against the pavement. Each one sent up a little 'coronet' pattern as it landed. The explosive reaction varying according to precisely the nature of what surface each drop was hitting, i.e. pavement, shallow water, moving liquid surface or static vibrating tight membranous veil of liquid. After a while the incessant bombardment seemed to enter my mind. There are moments like this when something forces itself on you in an unexpected manner. So sudden is the phenomenon that one is disorientated and plunged into confusion. Often the shock element changes your perception. It breaks down stereotyped responses to 'reality' and suddenly you see with an intensity of vision and perception that must have before been lying dormant. Often the revelation concerns a familiar occurrence. It is not just that which is on the other side of Venus or Jupiter, that is 'new' and magical, but rather it is what lies under your foot, or what your eyes see suddenly on opening, after sleep has dominated. For a moment the 'familiar' room seems impregnated with all the mysteries of the Universe. Re-evaluation of the nature of everyday reality can be as apocalyptic as Paul's experience on the Road to Tarsus. In hydrodynamics, air, as well as water is regarded as fluid, and vortices and associated spiral rhythms are present in each. Indeed, certain archetypal forms of movement may be found in all flowing media, regardless of their chemical composition. The spiral permeates nature from the 'Crab Nebula' of the macrocosm to the cochlea in the inner ear down to the sub-atomic particles of the microcosm.